Bandits the top seed in Class B South while Ramblers, Richmond are second in C and D South. The Winthrop and Bridgeway baseball teams entered this season facing plenty of questions. Suffice it to say, those questions have been answered. The Ramblers and Bandits are poised to enter the postseason among the higher seeds in their respective regions, with the tournaments set to begin its first rounds this week. The Maine Principals’ Association had yet to finalize Heal points, but most of the matchups were all but set. In Class B South, the No. 1 seed will be the team that didn’t even exist last year. Bridgeway, which formed when C schools Madison and Carrabec came together, found a perfect synthesis with the two rosters, turning in a 13-3 record that was good enough to wrestle the top spot away from the schools on the southern coastline that had owned it in the past. York (13-3) sits at No. 2, with Wells (10-5-1) and Cape Elizabeth (12-4, the top seed the past two seasons) also earning top-four seeds and the bye to the quarterfinals that goes with it. Bridgeway will be faced with a new challenge in the quarterfinals, since most of the potential opponents in B South are unfamiliar foes with the Bandits playing out of the largely Class C Mountain Valley Conference. Bridgeway has ample pitching depth with Ryan Emery, Dustin Crawford, Evan Holzworth and Evan Bess, however, and Franzose said there’s been plenty of talent to go up against in the MVC this season. One of the teams in that MVC mix was Winthrop, which faced the challenge of merely returning to the playoffs after missing the postseason last year. The Ramblers did more than that, climbing to the second seed behind Lisbon in Class C with a 10-6 record. Key reasons for Winthrop’s turnaround have been a pitching staff that has solidified with Jacob Hickey (6-0) backed by Antonio Meucci and Greg Fay, and a lineup that won’t drive the ball out of the park but has plenty of players that can get on base and spark a rally. Four hitters are over .300, two (Hickey at .420, Matt Ingram at .404) are over .400, and Cameron Gaghan is batting .320 out of the No. 9 spot. The result has been a high seeding that should be beneficial as Winthrop looks to make a deep run. The Class C South field is an example in parity. Lisbon needed just a 12-4 record for the top spot, and spots 4 through 9 are teams with 9-7 or 8-8 records. The juggernaut may be missing, but as Fortin said, so is the early-round pushover. Hall-Dale took the third seed with a 10-5 record, overcoming the absence of seniors on the roster to climb the standings while posting big wins over Lisbon and Bridgeway. The Bulldogs will face No. 6 Monmouth, which fell to 9-7 after going 16-0 last regular season, but which also sports one of Class C’s best players in Hunter Richardson and which beat H-D, 7-5, in their lone matchup. Traip, Dirigo and St. Dominic earned the fourth, fifth and seventh spots at 9-7, while Old Orchard Beach and Sacopee Valley are seeded eighth and ninth at 8-8. Across the way from Bridgeway in Class B’s North region, a pair of Central Maine teams earned byes by securing top-four spots. Erskine (13-3) is the third seed behind defending state champion Old Town and Hermon. Nokomis, despite holding the region’s best record at 14-2, is the fourth seed. The bye gives the Eagles and Warriors one less elimination game to play, but it also favors them from a matchup perspective going forward. 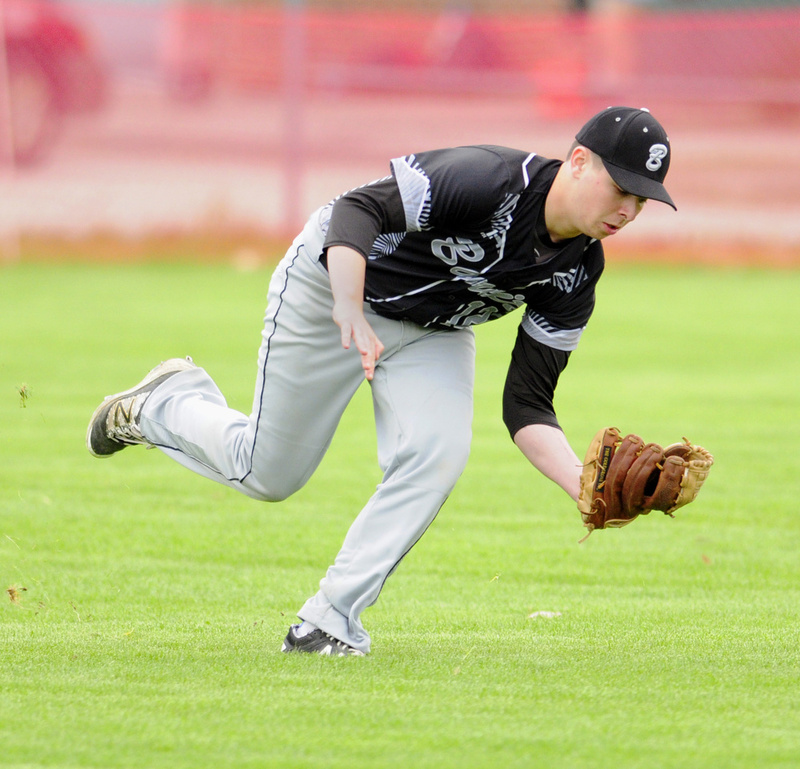 Gardiner (11-5) earned the seventh seed and Waterville (12-4) took eighth. The Tigers will play No. 10 Presque Isle, and the Purple Panthers will get No. 9 Foxcroft. In Class A North, No. 9 Lawrence and No. 10 Messalonskee, both 6-10, will have to travel to keep their chances at a Cinderella run alive. The Bulldogs will face No. 8 Camden Hills, while the Eagles will take on No. 7 Mt. Ararat. Both teams may have been fortunate with their matchups, however. Messalonskee opened the season with a 4-0 win over Mt. Ararat, and Lawrence topped Camden Hills, 5-2, on May 19. Class D South’s best record wasn’t enough to gain Richmond (14-2) the top seed, as the Bobcats will start the playoffs behind 13-3 Searsport. Not that it bothers coach Ryan Gardner much. What is is Richmond’s potent heart of the lineup, led by Zach Small, Brendan Emmons, Matt Rines, Tristan Shea and Danny Stewart, and pitching staff led by the likes of Small, Emmons and Rines. Richmond will face No. 7 Forest Hills, while No. 4 Rangeley will face No. 5 Buckfield and No. 8 Valley will meet the top-seeded Vikings in a rematch of last year’s D South final, a 6-2 Searsport win.